Our customers can’t afford to operate with outdated, inefficient payroll processes. To help them NOT to miss (and which means not to pay) new hires we have developed a new feature in 1708. In this blog I would like to explain you the new feature and the possibility you have to optimize your processes. An HR Administrator would enter the master data for the new hires in Employee Central and then the Payroll Administrator needs to add the necessary payroll relevant data (e.g. specific tax data). And only then the payroll can run successfully. Usually there is a (manual) process in place to inform (via e-mail, Excel-list) the Payroll Administrator to complete the new hires. But this process is time consuming and some new hires can easily be missed. The Payroll relevant data which needs to be completed before the payroll run differs from country to country a lot and you have also the possibility to configure this per country. That’s where our new feature will help you. How is this process now supported? Assuming your Payroll Administrators have the the access rights to our new object then they will new hires which were completed in Employee Central and successfully replicated to Employee Central Payroll on a new tile on the home page. The number 14 means, that you have 14 new Employees, where the Payroll Administrator needs to check before the payroll can run successfully. What happens if you click on the Tile? 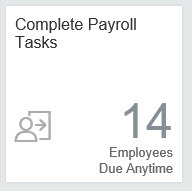 A new UI will open and on the left side you will see the list of new hired Employees and on the right side you see the mashups that the Payroll Administrator needs to fill. Currently keep in mind that we only consider the new hires, but in future we would also like to support different ‘payroll relevant events’ like Address Change or Termination. Therefore we have already fields on the left side to filter or sort this later. The list is generated automatically during successful replication. Effective From means in this case the hire date. ‘Hire’ under the picture means that it is a new hire. This is there to filter later for the other events like Address Changes or Terminations. ‘Open’: This is a status field can have currently ‘Open’ and ‘Done’. You see the mashups (Infotypes) that need to be completed based on the country. You can set the new hire task to ‘Done’. How to configure the Mashups (Infotypes)? There is an MDF Object behind (Payroll Data Maintenance Task Configuration) which you can adjust to your needs. 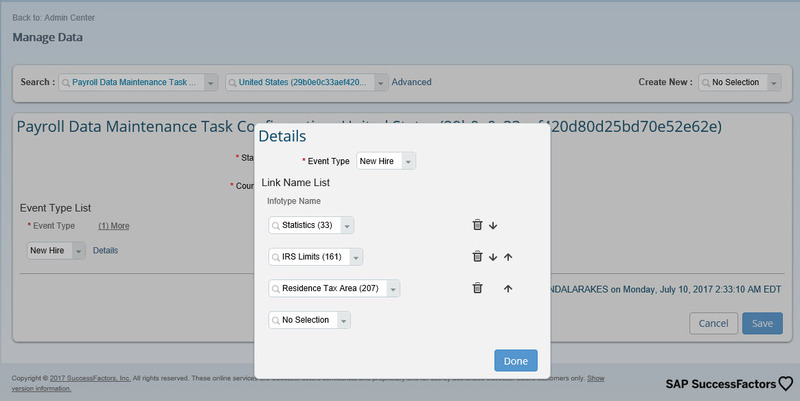 You can add/delete/sort the Mashups (Infotypes) per country and also per payroll relevant event. As this a new feature with 1708 we will enhance this feature with new functionality in the future. For Example we plan to have a new Configuration UI to make it easy for you to configure the Infotypes/Mashups per country. And we plan to include other payroll relevant events like Address Change and Termination. If you have any comments or questions please do reach out to me or leave a comment here. Great job with this blog Cornelia Storr! Very well explained with screenshots. Nice to see you writing here and I hope all is well.